Contact us today to put the Shoreline Aviation Services Team to work for you! We can be reached by toll-free telephone, internet, email, or fax, for your convenience. Or, visit our corporate headquarters by ground or air. 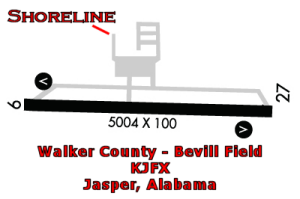 Our company hangar/corporate headquarters is located on the grounds of the Walker County-Bevill Field (KJFX) Airport. Follow the taxiway to the northwest ramp, and look for the company logo! Fly with us on social media!